American Heart Association instructor Tamara McLaughlin owns and operates her own training business in Vermont. The CPR & First Aid Blog sat down with her to chat about how she does it. Q: Tamara, what is your background? A: I began my career training medical assistants across Maine, New Hampshire and Vermont 24 years ago. One day, my boss informed me that I would start training physicians in CPR, which at that time I knew nothing about! It was intimidating, but I went through the classes and became an instructor with the American Red Cross. After a couple of years, I decided to teach American Heart Association coursework instead because I felt it gave a better understanding of high-quality CPR. Once I switched, the feedback I received from my students was overwhelmingly positive. That’s when I knew that I was on to something and decided to go into business for myself. Q: Would you tell us about your business journey? A: My company is called VT SafeyNet Inc., and I teach the Association’s BLS and all Heartsaver courses, including Heartsaver First Aid, CPR AED and Bloodborne Pathogens. I began simply: I designed and printed my business cards and mailed them to local doctor and dentist offices that had smaller staffs, which meant they were likely to not have internal training. This was a side job for more than 10 years, but eventually through networking at trade shows and client referrals I began to be hired by larger firms with regular needs. That’s when I switched to doing this full-time. I’ve been working for myself full-time for nine years now; I train about 2,500 students a year. It works best for me because that it allows me to set my own hours and, as such, I’m able to strike that work-life balance. I feel like I’m leading my best life. Q: What do you believe is the secret of your success, so to speak? A: I emphasize being enthusiastic, engaging, and utilizing humor to make the material less intimidating. I train people from all walks of life—from construction workers to hospital Chief Medical Officers. The most important thing is to customize my delivery of the material to serve how each person learns. Q: Finally, tell us why the American Heart Association is your choice? A: The Association teaches the science behind its material. When students ask me questions in class, I want to be able to fully answer them as opposed to providing routine talking points. The Association provides you everything you need to know. For my business, this put me miles ahead. Thank you, Tamara, for speaking with us and for being such a dedicated American Heart Association advocate! For Stacey Sassaman and Lloyd Emelle, it was a day like any other. They were visiting Stacey’s brother in Westchester, PA and decided to spend a quiet afternoon at the neighborhood coffee shop. The two took up seats next to an elderly man who seemed to be sitting and quietly daydreaming to himself. After a while the man, Joe, fell asleep in his armchair. Stacey, a medical student, noticed his sleep seemed erratic and his breathing uneven, so she and Lloyd opted to keep an eye on him. Lloyd and Stacey immediately jumped into action. Lloyd cleared the surrounding furniture as Stacey checked for a pulse. Right as she found it, it disappeared. They moved Joe to the floor, and Stacey began to perform Hands-Only CPR. The barista Stacey had spoken to called 9-1-1. Stacey and Lloyd performed Hands-Only CPR for almost 4 minutes until the paramedics arrived and took over. Once his pulse was restored, Joe was transported to a local hospital where he recovered. This is why Stacey, who is trained in BLS and ACLS, so strongly recommends the American Heart Association training—not just for medical professionals but for everyone. Most people who experience cardiac arrest at home, work, or in a public location die because they don’t receive immediate CPR from someone on the scene. It’s important to remember that as a bystander, your actions can only help. When someone collapsed at his workplace, Kurt wasn’t afraid to step in and perform CPR until emergency help arrived. The American Heart Association’s HeartCode BLS uses the latest eSimulation technology to enable students to assess and treat patients in virtual healthcare settings. Utilizing a variety of eLearning assets such as dramatizations, eSimulations, animations, self-directed learning, and interactive activities, this course teaches BLS knowledge and skills. This method of learning provides training consistency, adaptability to different learning styles, and flexibility for the student’s and employer’s time. Students can work at their own pace applying their knowledge to real-time decision making and skills development. 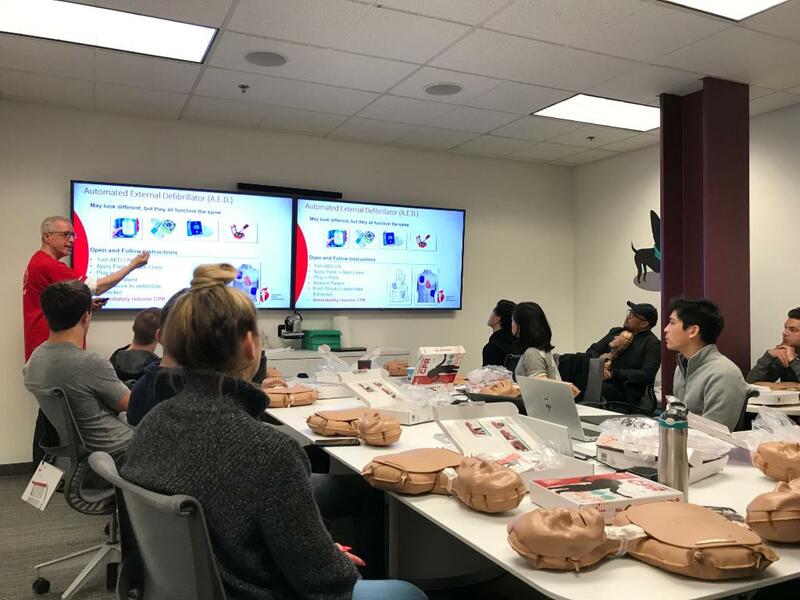 After completing the online portion, students attend a hands-on session to test their skills with an AHA Instructor or on a voice-assisted manikin (VAM). One day while playing in his backyard, a ball hit Justin in the chest in the exact location, at the exact millisecond of his heart’s rhythm, to send his heart into a fatal rhythm. This is a condition known as commotio cordis, a type of cardiac arrest. Thankfully, Justin’s friends and family acted quickly instead of freezing in fear. Every second counts in cardiac arrest, which can strike at any time. This powerful video from the American Heart Association and Anthem Foundation shows how a bystander can perform Hands-Only CPR and be the difference for someone they love.